An effortlessly chic, ultra slim timepiece by Skagen. Showcasing distinctive Danish design, this sophisticated watch is styled with a fresh white stone set dial. Elegant Danish designs inspired by the beauty of Skagen, Denmark. 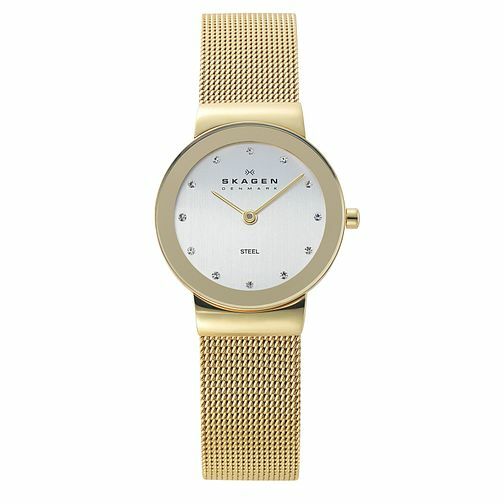 Skagen Ladies' White Dial Gold Plated Mesh Bracelet Watch is rated 5.0 out of 5 by 1. Rated 5 out of 5 by Anonymous from Beautiful lightweight classic watch I love this watch, I wanted something slim (not bulky) that I could wear out in the evening when I was in a gold jewellry moment and its lovely. Quality is superb although I've only had it now for 4 weeks, I'm not wearing it every day, probably 2 or 3 times per week. Its a beautiful, contemporary, slim watch. I'm a watch fanatic so impressing me is hard!